The first reaction I get when I propose this option is “how dare you”. Dodger fans have a strong connection to the stadium at Chavez Ravine, the same as any fans would with their traditional club home. But this affection, while understandable, masks that clubs and stadiums do move, and it can often be for the better. We also need to accept that football, however popular it may be in popular culture, is not really a downtown friendly sport. Clubs move and so do stadiums. A story of baseball in California is a story of mobility. California’s two most famous baseball clubs aren’t the only ones that moved from one place to another (East Coast to West Coast). 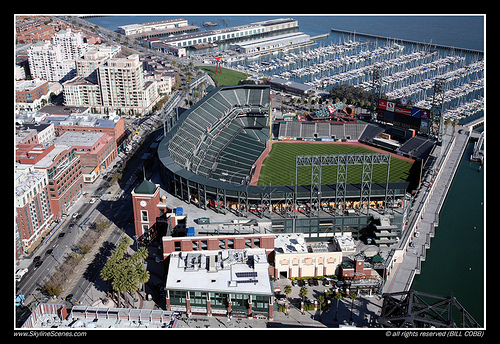 California’s baseball teams have often moved from stadium to stadium since baseball started in the GoldenState. Candlestick had been the home of the San Francisco Giants for 40 years; But baseball in San Francisco had been quite mobile. The very first baseball game ever in California was played in 1860 at Sixteenth St. & Harrison St., presumably on the site of what is now a SF Muni facility. This location was followed by Recreation Grounds, which was opened in 1868, also in the Mission. This stadium was destroyed in the 1906 earthquake, along with much of San Francisco. A new Recreation Field was constructed in 1907. In 1931, a new stadium, Seals Stadium, was built at 16th St. & Bryan St. for the new San Francisco Seals minor-league baseball club. When the Giants moved to San Francisco in 1958, they played their first two seasons at Seals Stadium before moving to their new home at Candlestick Park in 1960, where they remained until 2000, when they moved again to then-Pacific Bell Park, marking the sixth professional baseball field for San Francisco. If you think Los Angeles was any less mobile, think again. Like San Francisco, Los Angeles had a few minor league teams and stadiums before getting the Dodgers in 1958. In 1903, the Los Angeles Angles minor league ball club (no relation to the later MLB team) played their early seasons at Chutes Park, an amusement park field located at Washington Blvd. & Main St. They then moved to Washington Park in 1913 until 1925, when the Angels, moved again to Wrigley Field (no, not that one), also located in South Central Los Angeles. Unlike San Francisco, Los Angeles had another baseball stadium to host their local rival team. Gilmore Field, which was located at Beverly Blvd. & Fairfax Ave., hosted the Hollywood Stars (ironically, formerly the San Francisco Missions). In 1958, when the Dodgers moved to Los Angeles, they didn’t play in any of their minor league predecessor’s fields. Instead, they played in an oddly converted Memorial Coliseum. This, however, was intended to be temporary. In 1962, the Dodgers moved into their new and current stadium in Chavez Ravine. After kicking out an entire Mexican-American community through eminent domain, mind you. So similar to San Francisco, Los Angeles has a history of playing baseball on five separate fields. While the over 50 year run at Chavez Ravine for the Dodgers is no small chunk of time, it shouldn’t mask the fact that baseball stadiums often do change. The New York Yankees, for example, called home Yankee Stadium (original) from 1923 to 2008 – 85 years. Unless Angelinos feel they have a stronger connection to their stadium than Yankee fans did (thems fighting words). Nevertheless, the change of venue can often be not only for the betterment of the team, but of a neighborhood. Under normal circumstances, as a planner I would tell you that sports stadiums are poor tools for bringing in revenue for a city. But San Francisco’s Pacific Bell Park is a bit of an anomaly, and one I’m perfectly happy with. Pac Bell Park helped revitalized a once forgotten area of the city along King Street. Developers would call it a catalyst project, because the investment to build Pac Bell Park made other developers realize that the area was going to see improvement, and convinced them to come in and build their own projects, including many of the residential towers you see today. However, the biggest difference between Pac Bell Park and other stadiums being built is that Pac Bell was built completely with private funds. After the SF Giants were sold in 1992, the new owners agreed to pay for a new stadium so long as the City of San Francisco was willing to pay for the necessary infrastructure improvements, including new Muni light-rail lines. San Franciscan, the local economy, and visitors now reap the benefits of this decision; visible every day you visit now-AT&T Park and King Street. With the resurgence of cities as places to not only work but live, cities everywhere are trying to bring sports back downtown. But what is unique is that all these stadiums are baseball stadiums. And it makes sense. The culture around baseball makes it a very urban friendly sport. All the activity around baseball happens within the stadium or even your corner bar if you can’t make it. This isn’t true of football. Bringing us back to the topic of football and trading places with Dodger Stadium; wanting a new sports stadium in Downtown LA seems fine by me. But wanting a football stadium seems odd. The culture that surrounds football isn’t appropriate for a downtown setting, such as the one proposed by the City of Los Angeles. Unlike baseball, which can trace its modern-day origins to the mid 1840s, football’s modern game origins are traced only as far back as the early 1920s, with its wide popularity being traced even more recently as the 1950s. As an urban planner, I can tell you this probably had great affect around football culture. As a sport that developed in the mid-1800s, baseball is an urban sport. Cities were dominant at that period and our transportation modes were either walking or by horse, later followed by rail. At the time when baseball had come into its modern form, baseball stadiums needed to be located within walking distance or a short public transit ride away for fans to attend. In terms of how this affected people’s behavior, fans conducted all related business as a fan at the stadium. You did not linger outside the stadium in the same sense as we think today because lingering outside meant you were just hanging out in the street. So fans either entered the stadium or listened to their teams on the radio (when developed) at home or at a bar. Football, with its popularity more fully developed in the 1950s, was a sport for a new kind of America: an America of cars, highways, and suburbs. The popularity of the car cannot be ignored, as it is the car that really helped create one of football’s favorite pre-game activities: the tailgate. With a new popular sport and new primary means of transportation, we could now build bigger sports stadiums farther outside of town and provide parking lots for our new cars as well as a place for our BBQs and beer pong tables. Compare that to baseball when we walked to everything. So is LA telling me they are going to build (or keep the existing) parking lots around the new football stadium so people can still enjoy tailgating? Baseball in California has been very mobile. From its major league origins as two East Coast teams moved west, to constant changes in venue, our beloved game is no stranger to change. And neither should we as fans. So if we are willing to accept this, then Dodger fans should be willing to accept the potential for a move of their home team. As Los Angeles continues to find a way to bring football back, city officials and fans should consider the culture around each sport. Not all sports can be created equal in terms of where they and the fans can thrive. Football is a more suburban sport culture where cars and parking lots are not simply required for transportation, but an inherent part of the fan culture. Just look at the tailgating that happens at UCLA and USC football games. But with the efforts of Los Angeles to turn the LA Live area of Downtown into a thriving urban center, they should keep this culture in mind. You cannot ask a football team to move to a downtown stadium where you plan to replace parking lots with mixed-use development, nor can you keep the parking lots for the fans while claiming you are creating a new urban neighborhood. Ultimately, the cost of remodeling Dodger stadium for NFL use or demolition and new construction could prove prohibitive. 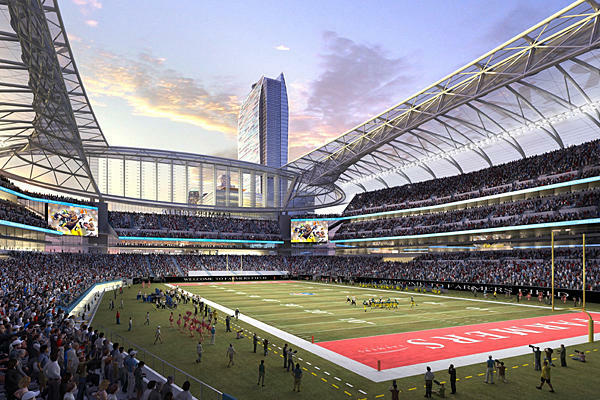 But the idea of an NFL stadium in Downtown LA seems impractical from the simple fan experience standpoint. If any team should move to Downtown LA, it should be the Dodgers. While the sentimental attachment to current Dodger Stadium is completely understandable; like all homes we’ve grown up in, we eventually move out. Full Disclosure, I’m a SF Giants fan. So meh. This entry was posted on August 19, 2013 at 12:56 pm	and is filed under Economic Development, Pop Culture, Urban Planning. Tagged: Baseball, Downtown Stadium, Los Angeles, Los Angeles Dodgers, San Francisco, Stadiums. You can follow any responses to this entry through the RSS 2.0 feed. You can leave a response, or trackback from your own site.